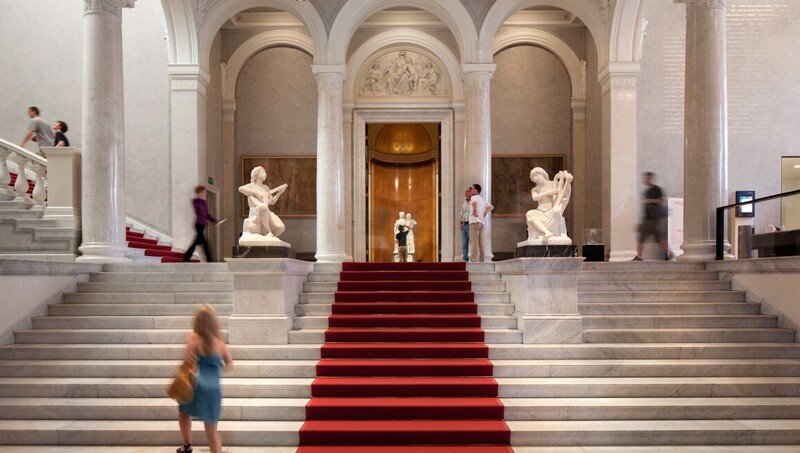 Opened in 1876, the Alte Nationalgalerie is the original home of the Nationalgalerie, whose collections today are divided between the Neue Nationalgalerie, the Hamburger Bahnhof – Museum für Gegenwart – Berlin, the Friedrichswerdersche Kirche, Museum Berggruen and the Sammlung Scharf-Gerstenberg. The basic architectural concept for the Alte Nationalgalerie – a temple-like building raised on a plinth decorated with motifs from antiquity – came from King Friedrich Wilhelm IV himself. The initial impetus for the construction of the Nationalgalerie was a bequest to the Prussian state in 1861 from the banker and consul Johann Heinrich Wilhelm Wagener, whose collection featured works by Caspar David Friedrich, Karl Friedrich Schinkel, painters from the Düsseldorf school, and history painters from Belgium. During the division of Germany, the 19th-century paintings that had survived the war in Western zones of occupation were housed in the Neue Nationalgalerie, starting in 1968, and in Schloss Charlottenburg’s Gallery of Romanticism from 1986. After the fall of the Berlin wall, the growing collections were united in their original building, now called the Alte Nationalgalerie.